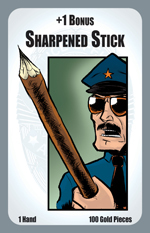 Given Axe Cop's gun bill, it's no surprise that he occasionally falls back on less advanced weaponry. And Munchkin players are certainly familiar with the "anything that will give me even just a +1 right now" frame of mind. Enter Sharpened Stick. With just a +1 bonus, it isn't going to be the core of anyone's arsenal (at least not after the first round), but it's a useful card to have around, especially if you get an extra Hand (like Handcuff Man). Oh, who are we kidding? You're going to sell it for a level as soon as you can. 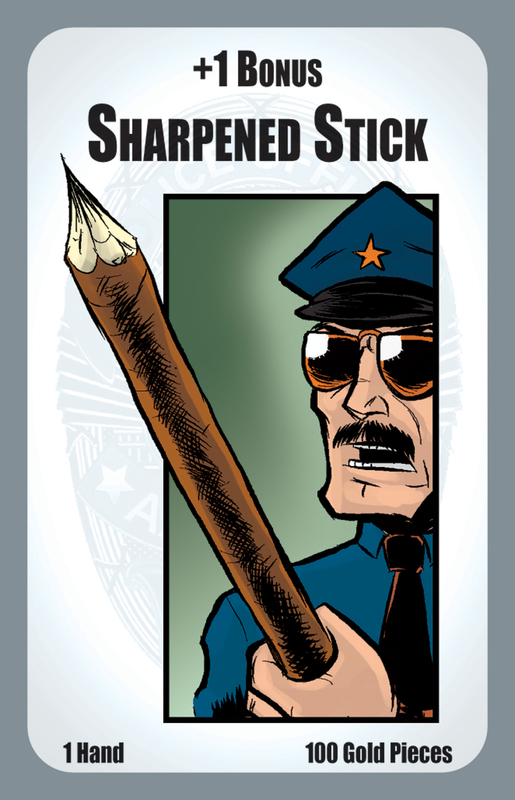 Sharpened Stick is a weapon in Munchkin Axe Cop, available this fall in game stores everywhere.